I have become obsessed with making smoothies after my mom showed me this amazing mixer she bought a while back and these nifty little easy to follow recipe magazines you can pick up at any grocery store. Smoothie King withdrawals have caused me to start making my own. I made a short video awhile back following one of the recipes. 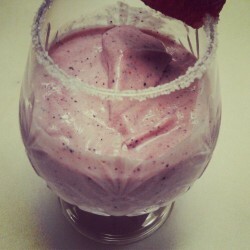 I’ve been experimenting, the other day I made a chocolate strawberry smoothie. It was pretty yummy. :9 But for this video I made a blueberry fruit smoothie, not sure why the blueberry gets to be in the name, but that’s what it was called. You can always substitute with fruit of your liking, my favorite combination is raspberries and strawberries. *Tip: sometimes the seeds sort of get in the way, so if you hate pulp then you might not like the texture the seeds leave behind, so you can always strain the smoothie before serving it in a glass. * Also, I’ve been having fun with using the cute cups my mom has acquired. Making a smoothie was actually a lot harder than I thought it would be, of course that could just be because I’m incompetent when it comes to making things that don’t require yarn or fabric. Before using actual measurements and this new mixer, I would just wing it. I thought making a smoothie was just about adding certain ingredients together. Oh was I wrong, I created some pretty gross concoctions. I won’t scare you with the details. But now my smoothies have been coming out pretty good, I’ve been having a smoothie every other day. Perfect treat for a hot day. 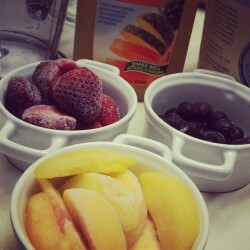 Hope you guys enjoy making your own smoothies and thanks for reading and commenting. So I have been wanting to learn how to knit a 3D heart for the longest time…ever since I first learned to knit to be exact. So this year I finally knuckled down and decided to learn. But I am the type of learner that learns better after watching someone else do it. So having two years of searching the net I found many tutorials for crochet versions and a few knitted versions. All of which were impossible for me to handle. 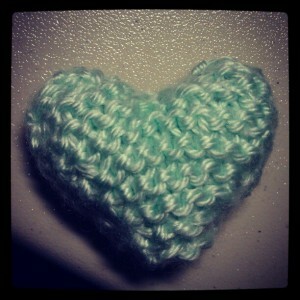 Then my favorite knitter just happened to post a knitted heart tutorial on her youtube channel. I proceeded to learn how to make the flat heart and then decided to make two flat hearts and sew them together to make it 3D. It came out alright for a first try but I was not as satisfied with it. 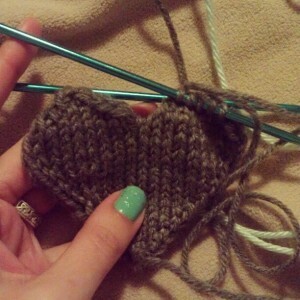 Then the next day she posted this wonderful tutorial on how to knit a 3D heart. And I was determined to master the pattern,after many crooked and lopsided hearts I have now memorized the pattern. I am still perfected it but I think I now have a handle on it. I decided to knit a few for my editors, I tied some around baggies of chocolate covered pretzels. And because I was in such a hurry I didn’t even take a picture of the finished baggies. But this isn’t the last you’ll see of these hearts. 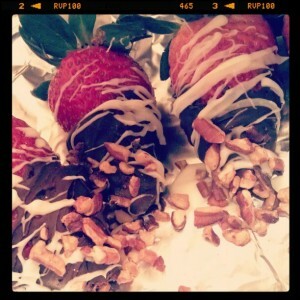 I intend to use them for many occasions.So we made chocolate covered strawberries, pretzels and even marshmallows. The chocolate pretzels were sooooo good, we had some leftover but they didn’t last for very long. :9 I’m also craving cheesecake at the moment. I always tend to update about food when I’m most hungry. So frustrating!!! Well that was my Valentine’s Day. I hope yours was just as nice and I hope you spent it eating delicious food. Because that’s how it should be spent. So I’ve been working on a few different sewing projects. But they haven’t been coming out like I hope. So I have stepped away from my sewing projects…for now. I’m the type of person who can’t sew if I’m frustrated. I end up making more mistakes so its just best to focus on something else. Thankfully there are many other things I can do to be creative. My best friend had her baby shower a while back and she had asked me to decorate a letter from her daughter’s name for her nursery. I got the letter L but I was having trouble deciding on how I wanted to decorate this letter. 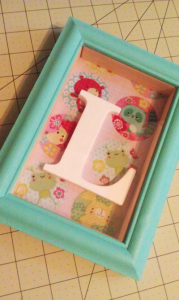 I knew I wanted to use a minty color, and then while browsing around Hobby Lobby I found a shadow box picture frame. I’ve always wanted to make a shadow box of my own but just never got around to it. So I found a small L and decided to make one for my friend. I had planned on putting some pretty paper behind the letter but then remembered I had some really cute fabric that matched the color of paint that I chose for the frame. I think it came out exactly how I pictured it, added bonus the bedding she registered for at Target totally match the shadow box. So that worked out great. :3 Moving on to the next creative topic. I finally got my hands on a SMASH* book. I’m really excited about it. Mija and I mention it over at our personal blogs, so feel free to check it out. We here at Mind-Speaks love crafting so we each fell in love with the SMASH* books. I purchased the Eco book and I’m loving it. 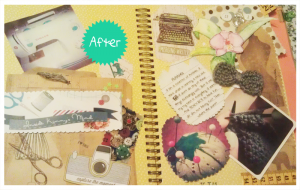 At first I was a bit hesitant, I didn’t want to “ruin” the pages. But once I started “smashing” I was no longer worried. And I’m now obsessed. 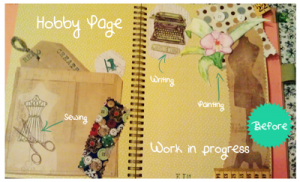 Right now I’m currently working on my hobby page. I first started with my more obvious hobbies. Writing and sewing are my big hobbies. But I like to think of myself as a collector of hobbies. I love learning new skills, however, I wouldn’t exactly say I exceed at them. But it doesn’t stop me from learning. I taught myself how to use a sewing machine and to knit. Thank goodness for the internet. Back to the page, so as you can see the majority of this page is focused on sewing. It’s the easiest hobby to smash. I was having trouble figuring out how to show case the rest of my hobbies. I turned to the net for some inspiration and I discovered a bunch of free printables. I immediately started pinning and printing. I do plan on making some of my own but I thought since these were done and ready for use I decided on making my own some other time. 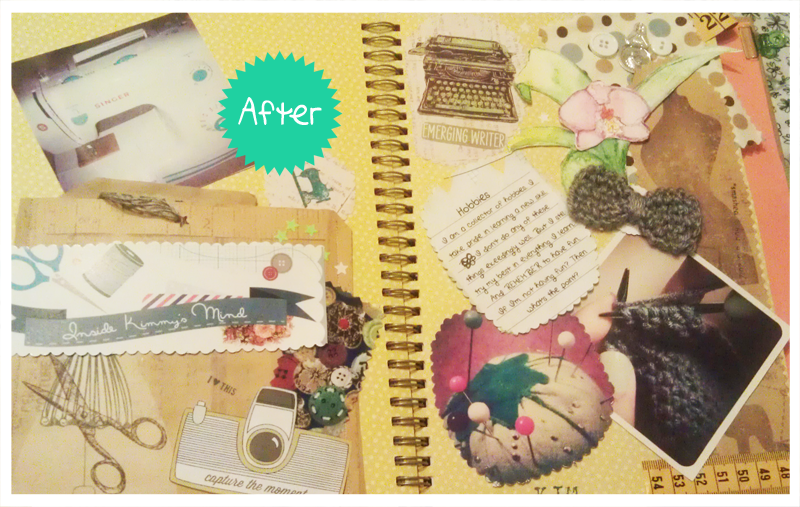 XD The ones I’m using on this page is a journal card from here and a capture this moment camera card from here. Great freebies if you’re interested. I used instagram pictures for this page, it actually helped clear the smashing block. I’m really happy with how my pages are turning out at this point. I kept thinking that I have to go in order when smashing but then I remember there are no rules to smashing. The point is to have fun with it and be creative. So this page is towards the back, I let the page speak for itself when I was deciding which one I wanted to use. The left page isn’t quite finished yet, there is actually a pocket on that side and I’m just trying to decided what I will smash in that pocket. I’m thinking maybe some poetry I wrote last semester or maybe a letter to myself. I dunno yet.